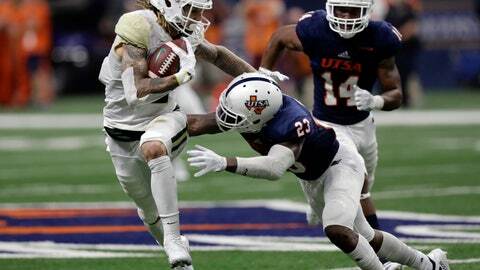 WACO, Texas (AP) — Jalen Hurd made the decision to become a receiver for one season at Baylor after being one of the top running backs in the SEC. The Tennessee native also wrote then that he knew the Vols’ read-option offense might not be the best fit for him, but he wanted to be “part of a beloved program.” He also wanted an offense that highlighted his ability to run while showcasing his ability to catch the ball. When he got to Baylor, Hurd had sit out last season because of the transfer. But even without being able to play in a game, it was a busy year making the transition to receiver while also being on the scout team in practice. As a sophomore at Tennessee in 2015, Hurd started all 13 games and was fourth in the SEC with 99.1 yards rushing per game. He played in 33 games for the Vols, starting 29 of them, and also had 67 catches for 492 yards. The running receiver is now among the national leaders with 47 total plays gaining at least 10 yards this season. Among active FBS players, he is 10th with 4,185 career all-purpose yards and 13th with 33 touchdowns — 26 (20 rushing, six receiving) at Tennessee and seven for Baylor.